BackupChain is a reliable and customizable PC and server backup software for Windows Server 2019 / 2016 / 2012 / 2008 and Windows 10-7, made specifically for IT professionals. You can fine-tune backups and use open standard backup file formats to back up your servers exactly the way you want, at a much lower price than other solutions. Our reliable and dependable backup software is backed by the BackupChain team, based 100% in the USA, that takes great pride in providing you with personal and responsive tech support whenever you need it. As a fully automatic and configurable backup solution, BackupChain offers file backup, disk backup, version backup, deduplication, and delta compression. BackupChain also includes database, live virtual machine backup, and Hyper-V backup, as well as a strong multithreaded engine for parallel processing. Files, databases, and virtual machines can be easily copied to network servers, USB, SAN, iSCSI, local drives, and FTP. Simple access to your data: BackupChain can be configured to use open standard backup formats (ZIP, 7Z, virtual disks, etc.) or the file's native format, regardless of whether you back up a file server, a VMware, or Hyper-V server. Backup tasks can be configured to allow you to access files directly from the backup folder, and much more. Our notable customers include: Canadian Federal Government (Dec 2018), Mitsubishi Tanabe Pharma Holdings America (Dec 2018), Supreme Court and District Courts of Albania (March 2018), BNP Paribas (Aug 2018), CLS Remy Cointreau (Aug 2018), DC Water, Washington D.C.’s water utility company (July 2018), TRUMPF Werkzeugmaschinen (July 2018), F. Hoffmann-La Roche AG (April 2018), HP (Hewlett-Packard, California, April 2017) and the City of London (Oct 2018). See more. The US Department of Education has over 85 servers with BackupChain Server Enterprise installed. After upgrading to v3, Gary tried our new disk imaging and bare-metal recovery features. 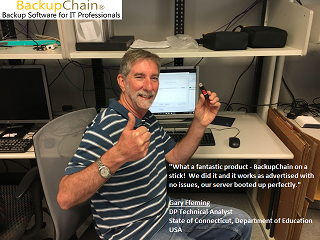 He created a portable, bootable USB stick with Windows Server 2016 and BackupChain on it: "What a fantastic product - BackupChain on a stick! We did it and it works as advertised with no issues, our server booted up perfectly!" V2V, V2P converter, and P2V converter: Convert physical server to virtual machines and vice versa, as well as between virtual machine platforms (V2V). Convert physical servers to Hyper-V to VMware or VirtualBox in all combinations. Remote and Cloud Backup (See our cloud backup plans); Or build your own DIY cloud using BackupChain's FTPS server and DriveMaker. Incremental FTP backup only uploads file content changes. Check out our notable customer list and reviews. We are committed to providing the best customer experience possible. Call, email, or chat with us whenever you have questions or need assistance. We are based in Baltimore, MD, USA: Tel: 1-800-906-5150 Email: support@backupchain.com M-F 9 AM-5 PM (ET). BackupChain is an all-in-one backup tool with fine-tuning features that professionals can use to adapt it to many different environments. It offers built-in data deduplication, file compression, and encryption and sends your backups to network shares, disks, FTP and cloud servers. You can send your important files to other company sites and back up data offsite between your offices. Granular Restore: This feature is crucial for restoring individual files and folders from virtual server archives within seconds. It saves you from restoring entire virtual disks and opens compressed and deduplicated media on-the-fly. Imagine the time savings (30 secs vs. hours) when restoring a small Word document from a 4 TB virtual machine image. This feature was implemented to work with Hyper-V, VirtualBox, and VMware Workstation and VMware Server. See this Hyper-V step-by-step example and this granular recovery guide. Granular Backup: This is unique to BackupChain and offers direct access to virtual server disks from the host without interrupting the VM. There is no need to install agents inside the virtual machine either. This feature is supported on VirtualBox, Hyper-V, VMware Server and VMWare Workstation virtual machines. See this guide with screenshots. Hyper-V module for Hyper-V Servers to run fully automated backup tasks on Windows Server 2016 / 2012 / R2, 2008 / R2, Windows 8 /8.1, including Windows Server Core and free Hyper-V Server editions. Automated VM backup and recovery, see this Hyper-V guide. Set up file retention periods as needed. Delete copies when original source file has been deleted with a time delay. All settings can be fine-tuned based on file type, for example, BackupChain can process *.docx files differently than *.VMDK. Professional server tool with an easy to use interface. Back up databases and virtual machines live. There is no need to stop or pause VMs. This applies to all VSS-aware services on your system. Your license includes a one or two year software update subscription plan and unlimited tech support incidents. Simultaneous file backups within each task are possible. Moreover, tasks can be scheduled to run simultaneously. Connect your offices together and back up one site to the other; securely and without cloud fees. Send your office data to your home office and vice-versa. Synchronize server files at several office sites. Protect data and transmissions using military-strength encryption (FIPS, HIPAA compliant). Rotate hard drives by simply swapping them whenever you want. No configuration needed. BackupChain is the only tool that can send as well as receive fast incremental backups from other servers or PCs. BackupChain utilizes innovative proprietary technology that allows it to efficiently handle millions of files, deep folder structures, and track file changes on large files. Delta compression was developed to back up very large files, such as database and VM disks. Rather than copying entire disks each time, only file content changes need to be backed up. BackupChain also works great with USB hard drives, combining low cost storage and fast processing. you'll agree that no other tool provides the same set of professional features to fine-tune, manage, and process your data backups. We believe in empowering the IT professional with easy to use yet powerful features, as well as open data format standards so you remain in control and ownership of your data. A great set of features in BackupChain focuses on virtual machine protection. Granular Backups allow access to files and folders stored inside a virtual machine. Instead of protecting the entire VM, you simply pull individual objects to be backed up--it's all happening through the host without using agents inside the VM. See this example for Hyper-V. The Granular Restore process is also a huge time saver: instead of restoring huge virtual machines, you simply pull out a file from your archive when you need it. It takes less than a minute! These features are available on Hyper-V Server 2016 Core and also on Windows Server 2016 and older versions, as well as for VMware and VirtualBox. Naturally all virtual machines are backed up live while they are running without interruptions, and on Hyper-V you can also back up cluster shared volumes the same way you back up local VMs. There is no need to back up the same huge database or virtual machine file over and over again. In-file deduplication works incrementally and differentially on a file-by-file basis. BackupChain scans the file and detects which contents changed. Then it compresses and backs up only those changes since the last cycle. BackupChain is the only server solution on the market to achieve this over standard FTP, as well as to local and network targets. See our Hyper-V backup solution on how to back up Hyper-V virtual machines using BackupChain's deduplication. For each data protection task, you can fine-tune how each file type is to be processed, such as: File Versioning, Incremental and Differential Deduplication, Retention Periods, Compression Type, Encryption, etc. You can back up files simultaneously and also run tasks concurrently as necessary. In addition, file may be retained by revision count, i.e. you can set up BackupChain to keep the last N versions of a particular file type. Whether you want full speed ahead using all available CPU cores and hard drive bandwidth, or a just a discreet background task, the entire spectrum is available. By limiting CPU cores and setting bandwidth limits you may reduce the system load of your backup or give it a boost at quiet hours. Our team is committed to providing you the best disaster recovery solution and provides free support during trial periods to get all your questions answered. If you need assistance, we are here to help! While you can always set up your own private and secure cloud using BackupChain, we also offer competitive, high-speed cloud backup plans starting at just $57.99 a month for 1000 GB. Using BackupChain’s plans you can send WAN optimized backups to our data center in Baltimore, MD, securely over the internet and protected with government approved AES encryption. Our servers are optimized to handle large backups and are hence ideal for Exchange Server and SQL databases and Hyper-V virtual machines because once the first backup completes, only changes are uploaded in a compressed archive. Using the cloud also allows you to restore your data from anywhere in the world. Because we do not throttle traffic to or from our servers, restore and backup periods are kept as short as possible. Beginning in May 2015 we expanded our cloud offering to include three different kinds of cloud plans: single server plans, shared server plans for up to three servers in the organization, and unlimited cloud backup. The new shared plans allow the same storage space to be used simultaneously by multiple servers and PCs in your business. Our cloud plans as well as our software are backed by a 110% money-back guarantee and there are no setup fees. Server plans are offered in terabyte increments, whereas shared plans start at 500GB. Discounts and plans up to 35 TB are available; please contact our sales department. Seeding and express recovery options are offered and may be necessary for customers with a slow internet connection. In order to seed your data, you create the first encrypted backup on an external hard drive and mail it to us. We then either hold on to it in case you need an express recovery in the future or mail it back to you. An express recovery option is available with 24 hour shipping within the U.S. so you can recover your data as quickly as possible if you have substantial portions of your data to restore within a narrow timeframe. Start your trial today; it's fully backed by tech support. Your purchases are backed by our 110% Money-Back and Best Value Guarantees, see here.